Is the Bhagavad-gita an extremist book? Are there any references in the Gita to the chanting of the holy names? Does the Bhagavad-gita teach that all paths lead to the same goal? Is the Bhagavad-gita shruti or smriti? Did it become important only recently in the Indian tradition? When we practice bhakti, we often expect to become freed from problems. And if that expectation is not met, we become disheartened. Dharmic traditions often compare the material world to a vast ocean. During our life-journey, we are meant to navigate through this ocean to attain eternal life. Just as an ocean sometimes turns stormy, the material world sometimes turns distressful. If we expect the ocean to be always calm, not even the best shipping captain can guarantee that – our very expectation sets us up for frustration. We similarly set ourselves up for frustration when we expect our life-journey to be smooth. But that doesn’t mean we have to be helplessly buffeted. The world’s storminess is aggravated by our worldliness; the more we are attached to worldly things, the more we suffer when those things are threatened or lost. Gita wisdom, including especially its recommended practice of bhakti-yoga, acts as a sturdy ship for us to sail through material existence. And this ship is unsinkable; we won’t ever sink as long as we stay inside it. That is as long as we keep our consciousness connected with Krishna, we stay anchored in the eternal, thereby buffering ourselves from the insecurity, anxiety and misery caused by the world’s temporariness. 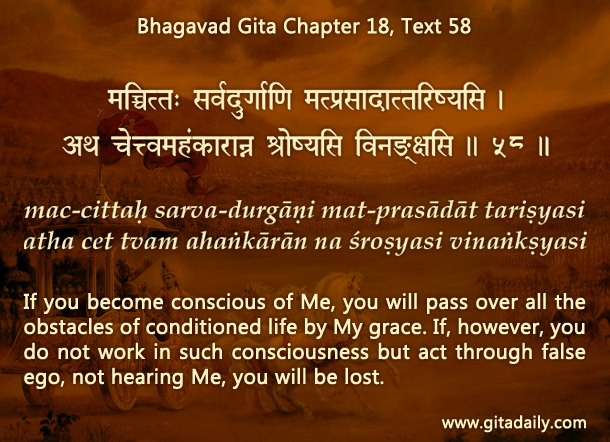 Pertinently, the Bhagavad-gita (18.58) assures that if we stay conscious of Krishna, we will cross over all obstacles by his grace. Therefore, instead of expecting that the ocean be storm-free, we can strive to stay inside the ship. Then we won’t hyperventilate amidst problems, but will resourcefully re-connect ourselves with Krishna. With this revised inner focus, we will find security by staying connecting with the one who exists beyond all storms. And he empowers us to weather all storms and steers us towards him for a life of eternal safety and joy. How does our expectation set us up for frustration? What aggravates the world’s storminess? How does bhakti help us weather life’s storms? If you purchase at Amazon.Com using the below link, ISKCON Desire Tree will gain a small portion without you losing anything.